Cardiac surgeons faced the problem of how to present surgical outcomes in a way that accounted for differences in case-mix between surgeons or over time. A simple graphical technique was devised, called VLAD. VLAD charts are now used world-wide for a variety of clinical outcomes. In the mid-1990’s, cardiac surgeons and surgical units were comparing 30-day mortality rates. Some were using a risk model developed by US academic surgeon Parsonnet to ensure fairer comparison with surgeons who took on a less challenging mix of patients. UK Surgeon Tom Treasure asked the Clinical Operational Research Unit at UCL to assist him in developing a way of incorporating such risk-adjustment into the time-series presentation of surgical results. Operational Researchers sat in on seminars and team meetings at the cardiac surgery unit of St Georges Hospital, immersing themselves in the context of this problem and getting a sense of how the cardiac surgeons responded to different forms of evidence and data. In parallel, the project team went through a process of repeated prototyping before settling on a simple graphical tool for the presentation of risk-adjusted mortality data in a time-series. Essentially, the chart, called a Variable Life Adjusted Display (VLAD) is a running tally of the expected number of deaths minus the actual number deaths, the expected number of deaths calculated using a risk model. 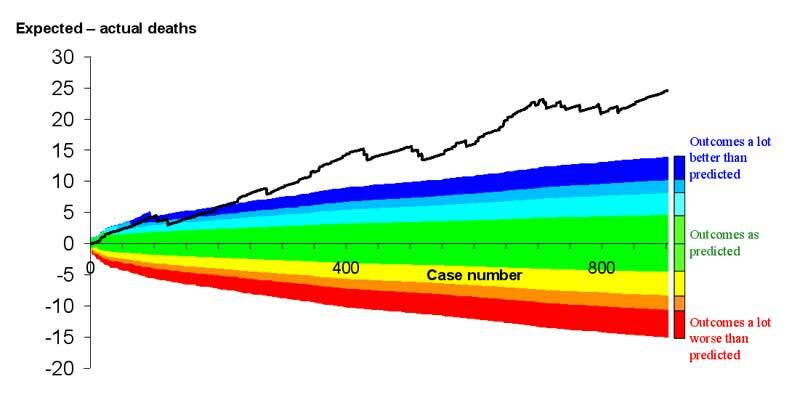 Subsequent versions have included colour coding to present exact prediction intervals associated with a sequence of cases (see below) and the use of chronological time rather than case number. This work continues to be a phenomenal success. VLAD is used by most if not all cardiac surgery units in the UK and by many worldwide. The technique has been adapted to monitor other clinical outcomes such as survival following myocardial infarction, the occurrence of surgical wound infections and neonatal deaths. Initial development 1996, Lancet paper 1997, incorporation in commercial clinical systems software circa 2000, software tool freely available from CORU website 2004, incorporated into Health Care Commission (now Care Quality Commission) surveillance programme and adopted as a key performance improvement tool by Queensland circa 2007.